It’s funny how once I learn how to bake something, I just keep baking them. I’ve always been fascinated with “the biscuit” and like many people my first one came from The Colonel. Well, fascinated by how something so tasty only comprised of few ingredients and relatively quick to make. Similar to my bad cookie incidents, my first few batches of biscuits came out dense and dry. But since I bought a whole thing of flour, I kept making them. Each time the biscuits came out better and better but still not what I think a biscuit should be, until couple weeks ago. 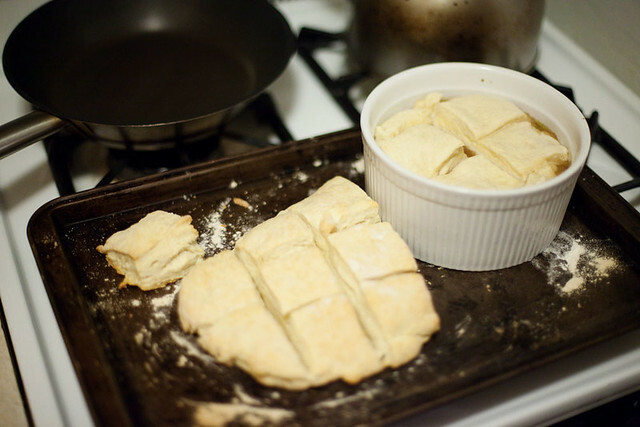 Couple weeks ago I found this biscuit recipe from Lisa Fain aka Homesick Texan. The biscuits came out pretty damn good. They rose nicely and weren’t dense at all. Ever since then I’ve made banana and honey biscuits and cinnamon and sugar. I’m thinking chorizo maybe next.